Nov. 22 — Republicans’ repeal-replace plan for the Affordable Care Act may include providing individuals with federal subsidies to buy health insurance outside public exchanges and allowing states to keep their own public exchanges. That’s the assessment of health-care policy professionals who spoke to Bloomberg BNA about what the exchanges may look like post-ACA. President-elect Donald Trump and fellow Republicans in Congress aren’t yet focusing on the exchanges as they ponder how to keep their pledge of repealing and replacing the health-care law enacted in 2010. But it will be crucial to resolve how to provide coverage to the millions of people who have enrolled through the exchanges and come up with a financially viable way for health insurers to offer nongroup plans. The 2017 open season is underway, and the Department of Health and Human Services forecasts that 13.8 million people will enroll through the exchanges, about 85 percent of whom will be eligible for ACA subsidies. Exchanges themselves are a good way to structure the nongroup, or individual, health insurance market, Gail Wilensky told Bloomberg BNA. Wilensky is an economist and senior fellow at Project HOPE, a humanitarian assistance group, and she was administrator of the agency that preceded the Centers for Medicare & Medicaid Services from 1990-1992 under President George H.W. Bush. “It’s really a question of how tightly regulated they are and what kinds of plans can participate, and who runs the exchanges,” Wilensky said. The ACA exchanges are tightly regulated, requiring health plans to offer a comprehensive range of so-called essential health benefits; submit their rates for review by federal and state regulators; and limit how much premiums can vary based on factors such as age and gender. An alternative model for health insurance exchanges could be the Federal Employees Health Benefits Program (FEHB), Wilensky said. The FEHB, which offers a wide range of health plans to federal employees, is operated by the Office of Personnel Management without statutory or regulatory mandates, she said. Premiums for benchmark plans in the ACA exchanges, on which federal subsidies are based, are rising an average of 22 percent in 2017 before subsidies are taken into account, the HHS has reported. In addition, many major issuers, such as UnitedHealth Group Inc., Aetna Inc. and Humana Inc., are scaling back their involvement in the exchanges due to heavy losses, leaving about 19 percent of enrollees with only a single insurer. That’s an increase of 2 million people from 2016, when 303,000 enrollees had just a single insurer option, Kaiser Family Foundation reported. Industrywide profit margins have continued to deteriorate through the three years the exchanges have been in existence, according to Erica Hutchins Coe, a partner in the Atlanta office of management consulting firm McKinsey & Co. Coe. She spoke during a webinar on the exchanges sponsored by the National Institute for Health Care Management Foundation. The industrywide margin for exchange plans dropped from a loss of 5 percent in 2014 to a loss of 9 percent to 11 percent in 2015, and losses are continuing through 2016, Coe said. Close to 30 percent of exchange plans in 2014 and close to 25 percent of carriers in 2015 were profitable, she said. 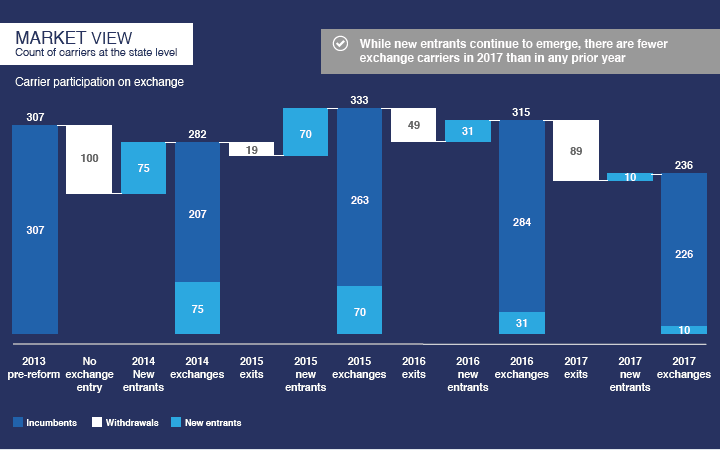 Exchange insurers’ troubles were further confirmed in a memo released Nov. 18 by the CMS verifying earlier guidance that no funds will be available for ACA risk corridor payments for 2015. The risk corridors program, which ends after 2016, was intended to protect exchange plan insurers against high claims costs, but not enough money was collected from profitable insurers to make the payments. Insurers that are doing well in the exchanges have adapted their plans for the exchange markets. For example, Blue Cross and Blue Shield of Florida Inc. has made a profit on its exchange plans, Jon Urbanek, the company’s senior vice president of health insurance markets, told Bloomberg BNA. The company, which covers 700,000 people in the exchanges and 4 million in the state, is the only health insurer to offer exchange plans in all of the state’s 67 counties, Urbanek said. About 1 million are expected to sign up for Florida Blue exchange plans in 2017, he said. The company took a “long-term approach” in developing “sustainable” premium rates and products, Urbanek said. “We didn’t just say ‘Let’s try to get very competitive and come in with the lowest rates.’ ” Florida Blue’s exchange rates are rising an average of 19 percent in 2017, he said. Like other exchange plans, Florida Blue has had to deal with a sicker exchange population, Urbanek said. In finding providers for its networks, joint targets have been set for affordability, sharing in health-care savings and quality, he said. In South Florida, the health insurer formed a partnership with a Colombian company to set up clinics, Urbanek said. “That allows us to really make a connection with that community” and it allows for better management of enrollees’ health-care needs, he said. Florida Blue also became a Medicaid carrier, even though Florida hasn’t expanded Medicaid under the ACA, Urbanek said. Medicare, Medicaid and the individual market for people under 65 “is where all the growth is in Florida,” he said. The state’s employer market, which includes many regional businesses but few large national companies, has shrunk in recent years, especially in the small group market, Urbanek said. But as for many other health insurers, Urbanek said, changes are needed to protect the stability of the exchange risk pools. The Trump administration could make regulatory changes quickly that could improve the prospects of carriers operating in the exchanges, Joel White told Bloomberg BNA. White is president of the Council for Affordable Health Coverage, an alliance of large employers, health insurers, medical providers, patient and consumer groups, technology companies and web brokers that advocates for lower health-care costs. “We’ve got to reverse the Obamacare policies that got us into a mess and do that immediately in 2017,” White said. Many exchange policies “have caused the insurers to question whether this is a valuable program to be involved in,” he said. “Right out of the gate they can eviscerate the individual mandate, which is not working,” White said. The ACA requires most people to have qualified health insurance or pay a penalty. “The Obama administration has been very generous with its hardship exemptions” from the mandate, and the Trump administration could expand the hardship exemptions, White said. The Internal Revenue Service reported that about 7.9 million taxpayers paid a total of $1.6 billion in so-called individual shared responsibility payments for 2014. Another 12.4 million taxpayers claimed exemptions from the individual mandate, the IRS said. Young adults under age 35 represented 30 percent of all taxpayers in 2014, but comprised a higher proportion—45 percent—of those who paid an individual mandate penalty or claimed an exception, the CMS said. That has prompted the CMS to partner with the IRS to conduct outreach to people who paid the fee or claimed an exemption for 2015 as part of an attempt to reach more young adults, which would help reduce claims costs and keep premiums lower. Other regulatory issues that could be addressed quickly include stricter verification to sign up for coverage during a special enrollment period as a result of life-changing events, such as marriage or the birth of a child, White said. People who enroll in exchange coverage during special enrollment periods have higher claims costs, health-care policy consulting firm Avalere Health reported. Either the Trump administration or the Obama administration may address problems with grace periods, White said. Currently, insurers must provide coverage to exchange enrollees for at least 90 days without payment, which has led to enrollees receiving medical services without paying premiums, he said. Insurers have advocated allowing states to determine grace periods or to set a 30-day grace period instead of 90 days, White said. Republicans will seek to phase out the ACA exchanges and replace them with private sector distribution channels for the nongroup market through which federal subsidies could be distributed, Christopher Condeluci, principal of legal and policy firm CC Law & Policy PLLC in Washington, told Bloomberg BNA. However, that would likely require at least 60 votes in the Senate to overcome a filibuster, Condeluci said. Republicans are expected to have just a 52-48 majority in the Senate in 2017. Republicans are likely to use budget reconciliation legislation that passed both the House and the Senate in late 2015 as a model to repeal the ACA. Reconciliation legislation, H.R. 3762—which President Barack Obama vetoed—didn’t require a 60-vote majority to overcome the threat of a filibuster in the Senate. But budget legislation is more limited than other types of legislation, and many changes Republicans want to make to the ACA would have to be passed under normal Senate rules, which are subject to the 60-vote requirement. Republicans likely will include a transition of at least two years in any reconciliation bill they pass, Condeluci said. That would allow for continuation of the exchanges and the subsidies, he said. The subsidies are available under the ACA for people with incomes of 100 percent to 400 percent of the federal poverty level. To bring some Democrats on board, Republicans may offer a compromise under which states could have the option of continuing to operate their own public exchanges, said Condeluci, who worked on the Republican staff of the Senate Finance Committee during consideration of the ACA. “If we were in a situation where a compromise was necessary, I would foresee Republicans being open to allowing states to make their own decision as to whether they want to phase out the exchange and allow private companies to work within that state, or allow the state to continue with the current state-based exchange,” Condeluci said. That would allow blue states such as California and Massachusetts to keep their public exchanges, he said. In 2017, 12 state-based exchanges, including the District of Columbia, will be in operation, with the rest of the states using the federal HealthCare.gov system. The HHS’s 2017 exchange enrollment forecast is at http://www.hhs.gov/about/news/2016/10/19/13-8-million-americans-expected-to-select-marketplace-plans-during-the-upcoming-open-enrollment.html. The HHS’s Health Plan Choice and Premiums in the 2017 Health Insurance Marketplace is at https://aspe.hhs.gov/sites/default/files/pdf/212721/2017MarketplaceLandscapeBrief.pdf. Kaiser Family Foundation’s Preliminary Data on Insurer Exits and Entrants in 2017 Affordable Care Act Marketplaces is at https://aspe.hhs.gov/sites/default/files/pdf/212721/2017MarketplaceLandscapeBrief.pdf. The NIHCM Foundation webinar, ACA Check-up: What’s the Prognosis for the Exchanges?, is at http://www.nihcm.org/events/upcoming-events/event/aca-check-up-what-s-the-prognosis-for-the-exchanges. The CMS memo, Risk Corridors Payment and Charge Amounts for the 2015 Benefit Year, is at https://www.cms.gov/CCIIO/Resources/Regulations-and-Guidance/Downloads/2015-RC-Issuer-level-Report-11-18-16-FINAL-v2.pdf. IRS Commissioner John Koskinen’s letter to Congress on tax filing data related to the ACA is at https://www.irs.gov/pub/newsroom/irs_letter_aca_stats_010816.pdf. The CMS fact sheet, Strengthening the Marketplace by Covering Young Adults, is at https://www.cms.gov/Newsroom/MediaReleaseDatabase/Fact-sheets/2016-Fact-sheets-items/2016-06-21.html. Avalere’s report on special enrollment periods is at http://avalere.com/expertise/life-sciences/insights/consumers-enrolling-in-exchanges-through-special-enrollment-periods-have-hi. Information on H.R.3762 is at https://www.congress.gov/bill/114th-congress/house-bill/3762.